The Capilano Suspension Bridge has had millions of visitors who have crossed the long and very high bridge since 1889. As you cross the Capilano suspension bridge you will hear sounds of nature, see beautiful gardens skirt and colourful totem poles. You will also see First Nations legends chiseled into cedar. The Capilano Suspension Bridge will provide you with a sense of peacefulness from the West Coast rainforest surroudings. 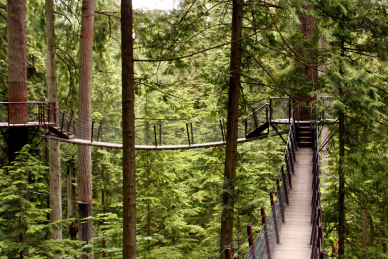 The reason why the Capilano Suspension Bridge is one of Vancouver, British Columbia’s most famous tourist attractions is because there are lots of things to see and do onsite. 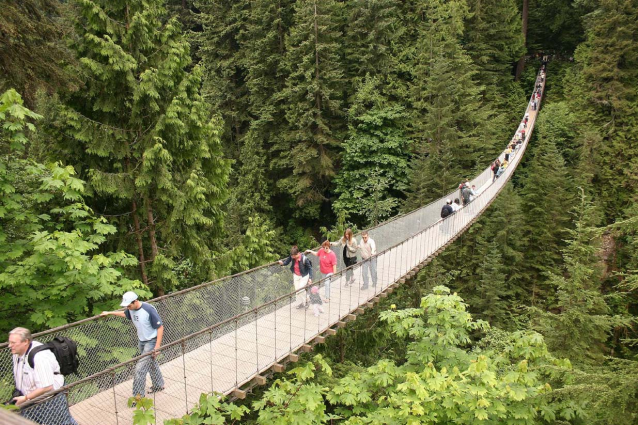 It is not far from downtown Vancouver, Capilano Suspension Bridge and area provides history, adventure and culture making this Vancouver tourist spot a complete British Columbia experience and should make your short list of things to do in Vancouver, BC. Bilt over a hundred years ago in 1889, the Capilano Suspension Bridge measures 450 feet (137m) across and 230 feet (70m) high above Capilano River. Since 1889 alot of other attractions has added to the 27 acre park. In addition to the bridge there are also gift shops with lots of quality merchandise from all over Canada and great homemade fudge. But wait there are also lots of other activities and attractions, see below. Treetops Adventure is the first venue of its kind in North America, offering a squirrel’s eye view of a thriving coastal forest. 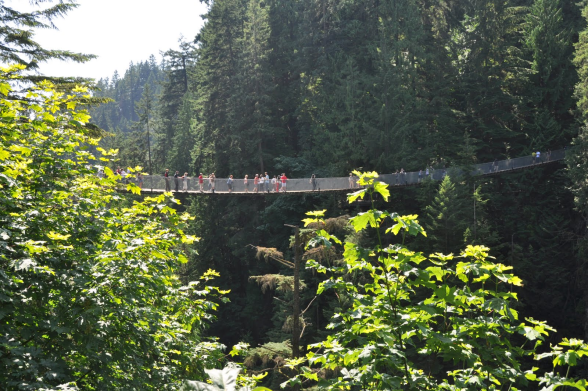 Visitors venture from one magnificent Douglas fir tree to another on a series of elevated suspension bridges, some reaching as high as 100 feet (30m) above the forest floor. You’re one of the Capilano Tramps, those early adventurers who made the long “tramp” to Capilano Suspension Bridge. Today visitors to Capilano Suspension Bridge can pose with the Tramps before they begin their walk through the Story Centre. Life-size photomurals, artifacts and antiques together with “voices from the past” and informative flipbooks chronicle the early history of the Bridge and the development of Vancouver. 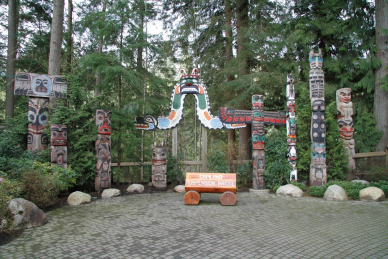 Part of Capilano’s captivating story involves the tradition of placing totem (story) poles on the grounds at Capilano Suspension Bridge. In the 1930′s Mac MacEachran invited local First Nations to place their story poles in the park, adding a First Nations theme. Those colourful poles are maintained in the exact condition in which they were received and are on display in the Totem Park. Get a glimpse into the lives of BC’s First Nations people at Kia’palano, our First Nations’ Cultural Center, as they share stories of their heritage and the historical connection between their culture and the natural world. Traditional weaving and beadwork is also demonstrated through the day. offered hourly year round and every half hour in the summer months. Visitors are well informed for their stroll through the rainforest, past tranquil trout ponds and majestic evergreens. This entry was posted in History, Tourist Attractions and tagged Bridge, British Columbia, Capilano, Kia' Palano, Story Centre, Suspension, The Rain Forest, Totem Park, tourist attractions, Treetops Adventure, Vancouver. Bookmark the permalink. No probs. We aim to inform tourist to all great places in Vancouver.